Completed pregnancy lasts about 40 weeks . Premature labor (or pre-term labor) occurs when contractions begin to dilate the cervix before 37 weeks of pregnancy . When premature labor cannot be avoided, the baby is born earlier, which can be risky for one’s health. 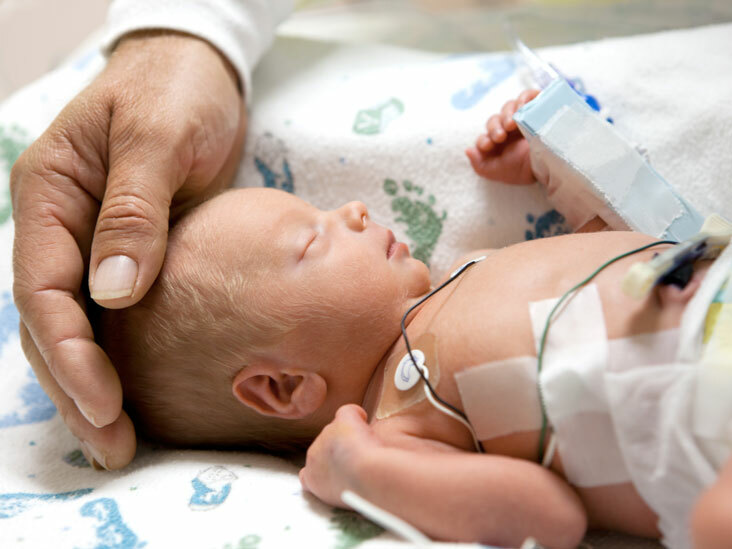 Babies born before term are more fragile and may suffer sometimes during their lives, problems related to prematurity. Although the causes of premature labor are sometimes difficult to identify, there are precautions to prevent it. Uterine bleeding. Certain conditions, such as placenta previa (the placenta implants and develops on the cervix), cause the rupture of the fetal membranes, which triggers premature labor. A stretch of the uterus. Multiple pregnancy (twins, triplets or more), as well as excess amniotic fluid, leads to uterine stretching that can lead to uterine contractions and premature labor. Bacteria or inflammation. A uterine infection can stimulate the production of substances that trigger pre-term labor. Physical or psychological stress Stress can cause the release of hormones that can trigger uterine contractions. In Canada, the rate of preterm birth is about 8%, one baby in 12 . In France, this rate is slightly lower, about 7% . Premature labor is a common problem of pregnancy. It is attributed 75% of the deaths in babies born without congenital anomalies. The length of the cervix . The length of the cervix, measured by ultrasound during routine pregnancy monitoring, helps to predict the risk of premature labor. The shorter the cervix, the greater the risk of premature labor. The fibronectin . A few hours before work begins, the fetal membranes change and release a substance called fibronectin. If this substance is present in low concentrations in vaginal discharge, the risk of premature labor is not high. However, even if the concentration of fibronectin is high, this does not necessarily indicate that premature labor will automatically occur. A recent WHO report indicates that in the majority of high-income countries, the rate of premature birth has increased in recent decades. In Canada, the rate of premature births is steadily rising from about 6% in the early 1980s to 8% in recent years. Late pregnancies (pregnant women after age 40) and the use of assisted procreation techniques, such as IVF , contributed to the increase in multiple births and premature births. In some developed countries, the increase in the number of cesarean deliveries or pre-labor births by choice of some pregnant women has also contributed to the rise in premature births. In the underdeveloped countries, the main causes of preterm birth are infections, malaria , HIVand the high rate of teenage pregnancies. However, whether in rich countries or in poor countries, a large number of premature births remain unexplained. Of regular and frequent contractions before the 37 Th week of pregnancy (more than 6 per hour), and a tightening sensation of the uterus. The first contractions sometimes look like menstrual cramps and do not disappear after a period of rest. The pain lasts at least 20 seconds and occurs at regular intervals. Premature labor or false contractions? Braxton Hicks’ contractions (also known as false contactions) are uterine contractions that occur less than 8 times per hour (or less than 4 times per 20 minutes). These contractions are not accompanied by bleeding or vaginal discharge and disappear after a period of rest. They are normal and do not increase the risk of premature labor. Some women sometimes find it difficult to tell the difference between premature labor and false contractions. Constant pain in the lower back. A feeling of abdominal pressure. A change in the amount or type of vaginal discharge or vaginal bleeding. Loss of liquid jet or drip (Common language: “burst water”). Pregnant women with twins (or other multiple pregnancies). Pregnant women under 18 years old. Women with chronic diseases, such as diabetes or hypertension. Babies born prematurely are more fragile and can sometimes suffer lifelong problems related to prematurity. In general, the earlier a baby is born, the health problems can be serious. Babies born before the 25 th weeks usually do not survive without problems. It is important for the pregnant woman to know if the symptoms she identifies are related to premature labor, as it is possible to stop or slow her down sufficiently. A woman who sees the early signs of premature birth can alert her doctor in time for him to intervene. Medications can be given to slow down or stop work for several hours and allow the fetus to develop as long as possible. Women who have had a child born prematurely (within 37 weeks of pregnancy) may on prescription take a progesterone supplement (Prometrium) as an injection or vaginal gel as a preventative measure. Eat healthy. If needed, consult a registered dietitian about your eating habits. If you are a victim of violence, ask for help. Take time to rest. Plan a time of day to rest or take a nap without feeling guilty. Rest is essential during pregnancy. Reduce your stress Share your feelings with someone you trust. Familiarize yourself with relaxation techniques such as meditation, massage, yoga, etc. Do not get tired when you exercise. Even if you are very fit, you should not, at certain times of pregnancy, increase the intensity of workouts. Learn to recognize the warning signs of premature labor. Know what to do if you are working prematurely. Prenatal meetings in the hospital or with your doctor are also made to inform you: do not hesitate to ask questions. Make regular visits to a health professional to monitor the pregnancy. The doctor can detect the signs that indicate a threat of premature labor and thus intervene to avoid it. Women who have had a premature child (less than 37 weeks of pregnancy) may receive a progesterone supplement (Prometrium) as an injection or vaginal gel. Progesterone supplements are usually administered between 16 and 26 weeks of pregnancy until the 36 thweek. These supplements are not effective in pregnant women with twins and have not been shown to be effective in women without a history of preterm birth. In some women at risk or with too much cervical opening, the cervix is ​​sometimes strapped. This operation involves tightening the opening of the cervix with a wire. The wire is removed when the baby is considered to run around the 37 Th week of pregnancy. Treatments administered to slow or stop preterm labor are intended to allow fetal lungs to grow to full maturity (usually after the 34 Th week of pregnancy). They also allow the pregnant woman time to move to a hospital or a professional center that can provide the necessary care for the premature child. Drugs such as tocolytic agents ( terbutaline, magnesium sulfate, nifedipine indometacine and atosiban) are given to relax the uterine muscles and stop contractions. These medications are usually given if the pregnant woman is less than 34 weeks pregnant. They can stop contractions and allow a delay of several hours, up to 48 hours. These medications are usually given in combination with an injection of glucocorticoids (betamethasone) that can accelerate the maturation of the preterm infant’s lungs and prevent certain complications of the circulatory system.